Samsung gave us a brief glimpse of its foldable smartphone during the Samsung Development Conference (SDC) 2018. The company has been hard at work on this phone with a foldable display and we should see it all come to fruition in 2019. There have been plenty of reports and rumours regarding the Galaxy F, which could end up being called the Galaxy Fold. However, not a lot of details have been available regarding the cameras onboard, until now. According to a new report, the foldable smartphone from Samsung will feature a triple-rear camera setup similar to the Galaxy S10. The report comes via Korean news site ET News and states that we can expect a similar configuration like the Galaxy A7. Of course, the sensors would be much better than the one found on the A7, but the placement should be similar. The triple-rear camera setup will include a standard sensor, a depth sensor, and an ultra-wide sensor. The report also mentions that the camera performance would be just as good as the upcoming Galaxy S10. Apart from that, previous reports have stated that the foldable phone would be powered by the Snapdragon 855 chipset and include 8GB of RAM. Select variants of the phone will also be powered by Samsung’s Exynos 9820 chipset and the phone would have a massive battery thanks to the available space. Reports suggest that the phone could feature up to 6000mAh of battery. The phone is said to feature a 7.3-inch display when it is unfolded, and a 4.58-inch display when folded. Another report states that Samsung would be launching the new Galaxy foldable smartphone in several European regions this year. Samsung is confident that people would be interested in this phone and is making the phone available across the world. 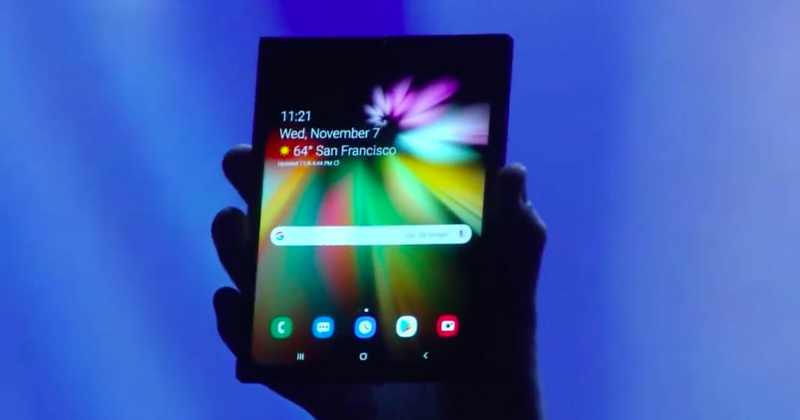 The report found that Samsung has registered the Galaxy Fold trademark in Turkey, Netherlands and Belgium. The phone is expected to be launched in the first half of 2019 and will cost you a lot of money. Various reports have suggested a price tag of $1500 and above, which isn’t surprising considering the technology involved in making the phone.